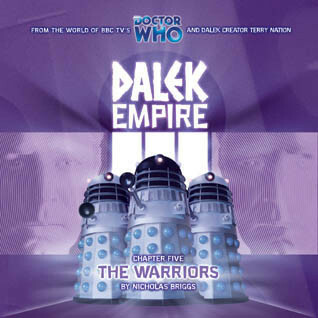 This is part 5 of 6 of Dalek Empire III. You came for David Tennant but you're staying for the Daleks. Or vice versa. "The fight against the Daleks must succeed now. But while the Wardens are outnumbered and without a strategy, the Dalek Supreme is sensing victory." What did you think? Is this the best part yet? Or the third best part yet? TELL ME? Why do the characters I like always end up as Dalek slaves!? Ridiculous. Now we see Galanar and Elaria meet up with the Wardens. Handy that they swooped down with their ship right in time! Of course, I don't know how their trek to get evidence against the Daleks will go, what with the Daleks following them and all. We're finally seeing the Dalek's final plan with the 'cure' of the plague. Turn the people into Daleks! I figured it would be that or something close, but it seems like it took ages for it to finally get there in the story. Once again, this is what happens when people trust the Daleks. I kind of guessed their plan but I like it. To induce a plague and "cure" it as a means to turn people into Daleks. And agreed, these Dalek Empire stories are very good at getting us to like a character and then be like "Now they're a Dalek. Enjoy." I like that the different main characters met up. All of these parts kind of blend into each other and I'm having difficulty remembering what happened in each individual part. Yep, the reveal of the plan wasn't as game changing as Dalek Empire I, but it's still a good one. It's a good thing not to have it all relied on the big decision. Then again, there's still an hour left so anything could happen. Once again the best parts of the story were the Demons arguing their position to Sie and the Wardens. I'm pumped for the conclusion. I'll probably start it tonight and finish it tomorrow. yeah so now they gotta go back to Valisha to get another copy of the stuff Sye was supposed to bring to the government to convince them the Daleks are bad (cause they're still all buddy-buddy cause the Daleks are transporting masses of people to special healing planets (which for some reason has stockpiles of empty, shiny new Dalek armor-shells) to fight the plague). oh yeah, there's this lady who's been living on Valisha and studying psychic remnants of Kahlendorf (so she knows all about the Daleks (prolly more than they do about themselves)) and she was the one who warned Sye and gave him all the stuff he was supposed to bring.